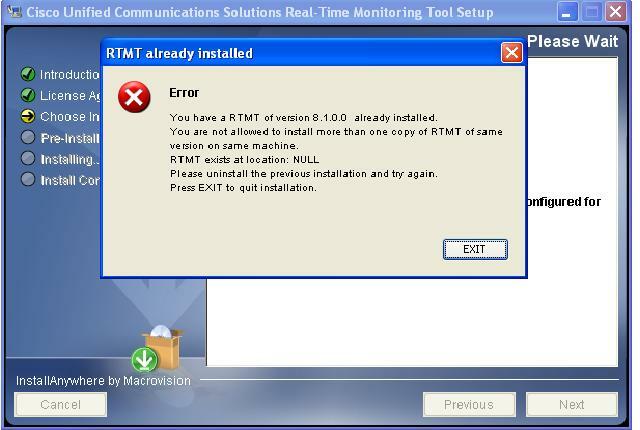 I have a virtual machine where I have several RTMT versions installed. I use it whatever suits customer version. RTMT version already installed and you cannot have same version blah blah.. I went into the Add/remove program and uninstalled the RTMT. All good. Got an error > Cannot locate the uninstall file. I was kind of stuck, I had to run the RTMT and my RTMT was not working. I statred looking for it on the internet but no joy. After spending some time on the Internet I found the solution posted by a TAC. This fixed the issue. I thought it’s worth Sharing. Go to C:/Program Files/ Zero G Registry open the file “.com.zerog.registry.xml” in a text editor. It’s a hidden folder so make sure you view hidden files/folders as well. Open the file ‘.com.zerog.registry.xml’ in a wordpad and remove the entries correspondonding to RTMT 8.1. Make sure you remove within the XML tags. - <product name="Real-Time Monitoring Tool 8.1" id="764ff1c4-1ee5-11b2-a2b1-9ff21e0a5268"
- <! [CDATA[ This installs the application feature. <component id="09316d9f-1eef-11b2-96a7-8c96050bbc8d" version="8.1.0.0" name="Rtmt Common"